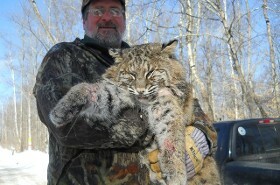 Hunt everything from deer to bear and even bobcat with our seasoned hunting guides in Strong, Maine. With more than 10 years in bear hunting business, Spruce Mountain Guide Service offers reasonable pricing for great bear hunts in the beautiful Western Mountains of Maine. Backed by more than 22 years of experience, our hardworking guides offer the best in deer hunting, bear hunting, moose hunting, bobcat hunting, turkey hunting, grouse hunting, and snowshoe hare hunting. Call today for more information. No one will work harder to make sure you get the trophy of a lifetime. Our owner-operated company specializes in guiding small groups on very personalized bear hunts that will easily exceed your expectations. Several trophies that we have taken over the years have made the Maine Skull & Antler Club™, as well as the Pope & Young Record Book™. Call today to bring home the trophy of a lifetime. Hunt with a registered Maine guide who has 22 seasons of guiding experience all over the state of Maine. Scott, a professional logger, spends almost 365 days a year in the Maine woods bear hunting, fishing, and trapping nearly all his life. He has raised hound dogs for bear hunting and bobcat hunting since 1979 and is still breeding and raising these hounds with the same passion that he has had since he was a teenager. In a state as large as Maine, nothing can take the place of experience, to identify the places with the greatest potential for trophy deer hunting, bear hunting and bobcat hunting.. Contact us today to make lifelong bear hunting memories.